Let’s start with a question. What download speed would you expect in this scenario? 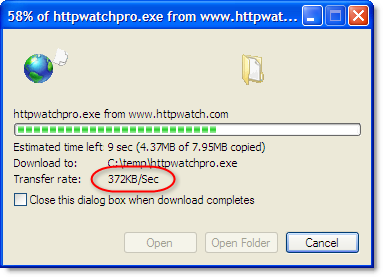 The download speed of 1.57 MB /s or 12.56 Mbps (i.e. 1.57 x 8 for 8 bits per byte) was over 60% of the theoretical maximum for the internet connection. That’s quite respectable if you allow you the overhead of the IP and TCP headers on each network packet. This time the download speed was 372 KB/s or 2.91 Mbps – less than 15% of the advertised internet connection speed. 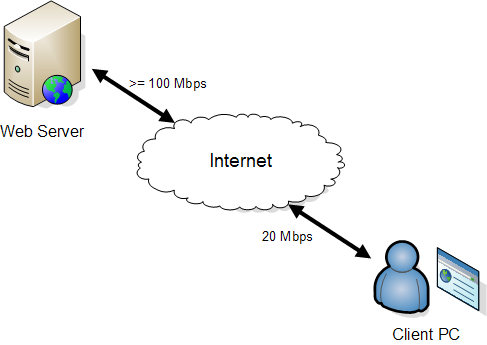 Slide 7 of his talk shows that with standard TCP connections the round trip time between client and server (i.e. ping time) imposes an upper limited on maximum throughput. The ping time determines how many TCP windows can be acknowledged per second and is often the limiting factor on high bandwidth connections as the maximum window size in standard TCP/IP is only 64 KB. Let’s try putting some numbers into the bandwidth equation to see if it matches our results. 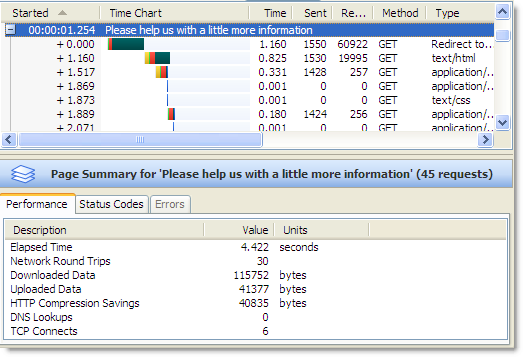 For large downloads in IE the TCP window starts at 16 KB but is automatically increased to 64 KB. This value agrees fairly well with the measured figure. The 1.5 factor in the equation represents the overhead of the IP / TCP headers on each network packet and may be a a little too high explaining some of the difference. In the past, with dialup connections the maximum throughput value was much higher than the 56 Kbps available bandwidth. But with today’s high bandwidth connections, this limit becomes much more significant. You really need to geographically position your web server(s) or content close to your users if you want to offer the best possible performance over high bandwidth connections. There’s a post over on the Gmail blog by Wiltse Carpenter, the Tech Lead for Gmail Performance, about how they used HttpWatch and other tools to speed up the login for Gmail. Web 2.0 is a term often used to describe next generation web sites that have moved beyond the simple page request->process->response cycle and are utilizing services on the web server to return data that can be rendered without making page transitions. The result is often a more responsive user interface that closely mimics a desktop application. It can reduce the size of uploaded and downloaded data because it allows the web programmer to control exactly what is transferred. 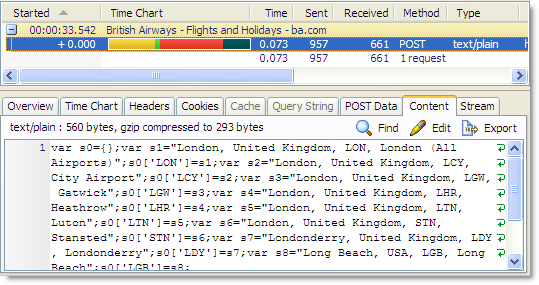 For example, if a user performs a search the data can be returned in a compact data format (e.g. JSON ) rather than HTML. In order to illustrate how Ajax can increase the speed and usability of a site let’s first look at a traditional web site and then compare it to an Ajax example. Even if there are no further mistakes we will still have to make further page transitions before we get the results we’re expecting. 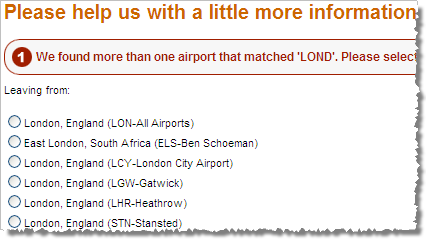 Here we did exactly the same thing – typed “LOND” instead of London. Instead of having to press submit, fetch a new choices page (with all linked page components) and drag the user through an additional form, the page used background processing to query the server and display a list of possible choices. 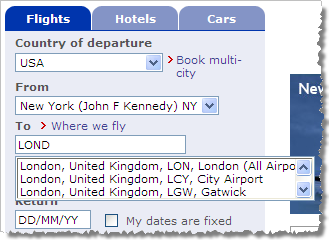 Let’s say you wanted to populate a list box with city codes based on the country a user selects. In Web 1.0 you would have to submit a form making a round-trip to the server with your choice of country so that the server could render the appropriate list of choices on the resulting HTML page. The products <div> is initially empty, but the load() method wraps XmlHttpRequest and fetches some HTML from the server and uses it to populate the <div>. One of the drawbacks people found with using Ajax was that they ended up breaking the back button. Clicking the Back button in some Ajax applications did not go to the previous logical operation. For example, if you were viewing the results of a search you would expect Back to take you to the search page so that you could modify the search criteria. Instead, the user would be taken to whatever happened to be the previous page in the browser’s history list. In some cases, they may even have been the previous web site that the user had visited. More recently though, browsers have exposed object models to help Ajax applications manipulate the browser history artificially so that they can correct the flow of operations as the user uses the forward and back buttons.